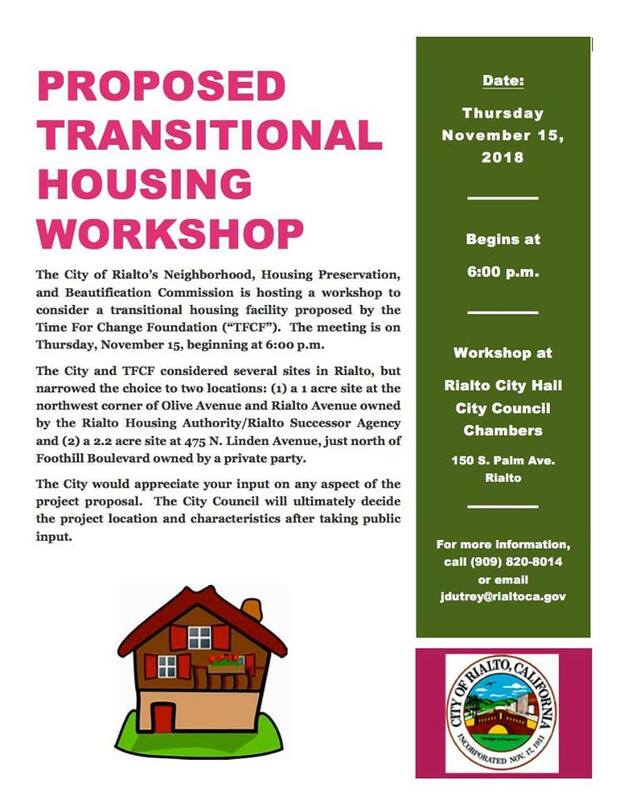 The city of Rialto after a heated and contentious city council tab item on September 11th 2018 is finally giving Rialto Residents what they deserve, a right to voice their concerns on the proposed project. 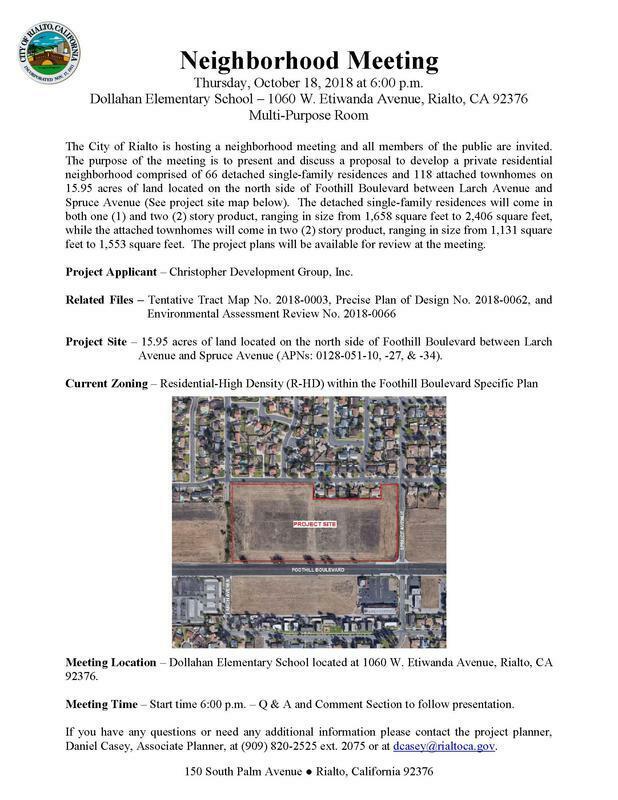 (2) a 2.2 acre site at 475 N. Linden Avenue, just north of Foothill Boulevard owned by a private party. The City would appreciate your input on any aspect of the project proposal. The City Council will ultimately decide the project location and characteristics after taking public input. Both proposed sites have created concern in the minds of residents. The original site is in a downtown area zoned for cottage commercial and is not a desirable addition to the current residents in the area. The 2nd and most recent proposed site is even worse. The 2nd area is an area already dealing with large amounts of crime from other multi family dwellings and has multiple homes that are used as group homes where homeless and mentally ill people roam the streets and harass residents and in some cases have defecated on homeowners lawns. The community on Linden is a older neighborhood and nobody wants to see more transitional housing dumped there. 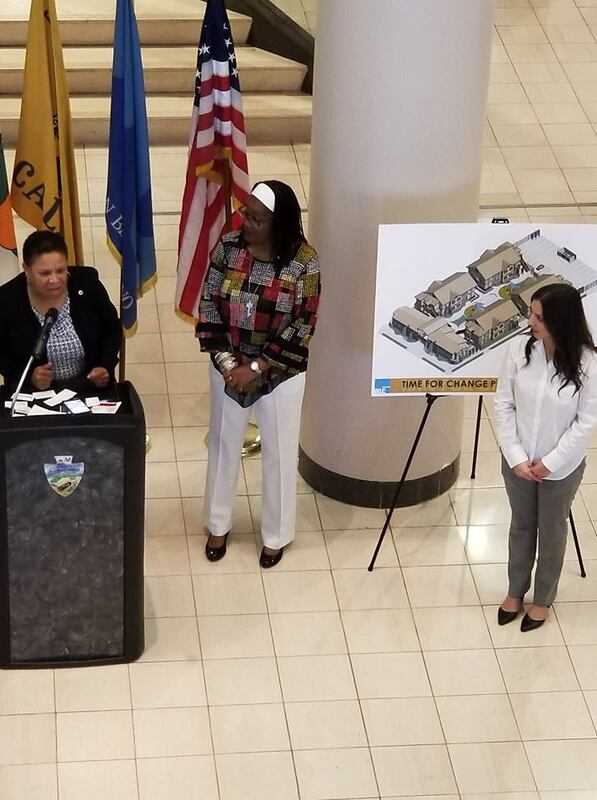 Even though everyone keeps calling the work being done here a feasibility study the mayor has been jumping into every picture she can and is doing her best to push this facility on Rialto. Rialto has seen a boom in development this year with the opening of the new Super Walmart development on the south end and the Renaissance development in the north end of town. Each development has come with its own unique set of challenges to reach the point of completion. The last few developments that have been handled by one developer have seemed to fall short of the promises made and this developer is a close friend and campaign contributor to Councilman Ed Scott. Fernando Acosta is a business owner and developer who lives here in Rialto. He owns the Popeye’s fast food restaurant on Ayala and Baseline and has been the developer of the In-N-Out Burger restaurant pad and now the area of the Cracker Barrel. The Coffee Bean & Tea Leaf almost didn’t happen. There was supposed to be a Miguel’s Jr.
Other retail uses were planned but never added. Responsibility to clean the lot still resides with the city. Now Mr. Acosta is the developer of the Cracker Barrel site and has hit a bump in the road and Mr. Acosta is looking for the city to bail him out! As you can see staff is telling the city council that this is a bad idea and a bad position to be in. Mr. Acosta is more than a year out on completing pad 3, yet he wants the city to put our money in jeopardy. Staff points out multiple times that this is a bad idea and reminds the council that this is General Fund money and that the city has already assisted Mr. Acosta. To add insult to injury the council directs the City Treasurer to broker a finance deal for Mr. Acosta between the city and Banner Bank. When was the last time the city ever bent over backwards for a resident or business owner in this city when it came to the financial dealing of a new house or business construction? Councilman Ed Scott claims he doesn’t want to see the project delayed but empty stores still exist across the street in the Renaissance development and that hasn’t hindered anything? There are tons of empty buildings all over Rialto especially on Foothill – one of Rialto’s most heavily traveled routes. Where is the city council jumping to intervene in those situations? Maybe it is because there are no campaign contributions in it for them in those situations? Another item that should cause great concern to Rialto residents is that Mr. Acosta stands to make a lot of money on this deal. So we’re going to put tax dollars and the city into a risky position so a developer can make a ton of cash? Does that smell to anyone else? The truth of the matter is that Cracker Barrel is already well under construction and the other tenants are ready to begin construction soon. Mr. Acosta has done this before – promised tenants that never materialize. I looked at his presentation to city council as a bad pitch on Shark Tank. He spoke of offers to fill spaces but never produced any proof, it seemed clear he was pulling a favor from the campaign favor bank! See video of the full tab below! Eloise Reyes has been your assembly member for about two years now and nothing has changed, right? Wrong. She has made this area more divisive and polarized than ever before. One major change may not look so bad on the surface, but it is now affecting Moreno Valley. Under former Assembly Member Cheryl Brown Rialto had a strong young man acting as our liaison with the Assembly Member’s office. I can tell you as someone who had issues with connecting to the Unemployment Office Cheryl Brown’s staff helped a lot more than the current staff. Before Eloise won the election we had Josue Castillo as our Rialto liaison. Josue lived in Rialto and really made you feel like they cared, even if you were not aligned politically. Now we have Daniel Peeden, a progressive Democrat who gives you the feeling he is trying to intimidate you rather than help you. 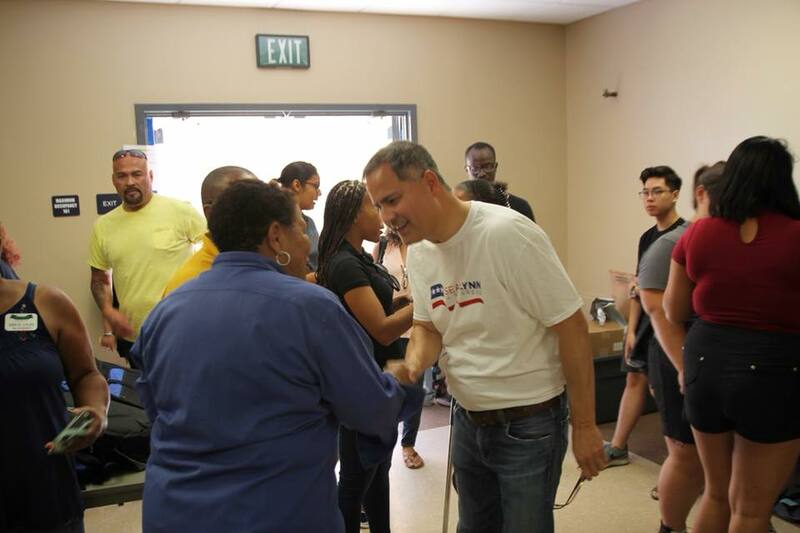 He spends his time pushing a very strong progressive agenda and it doesn’t feel like he cares who the Assembly Member cuts down or steps on along the way. If you’re not a progressive you have no worth to him. 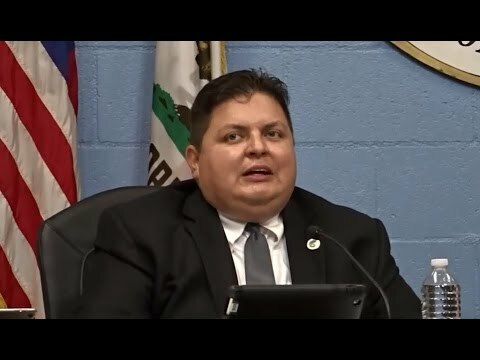 He spends his time attacking our County Supervisor Josie Gonzales (a Democrat) on warehouse projects in the Bloomington Area, yet has given a pass to the City of Rialto as they dump warehouses right on top of long established neighborhoods and eating up prime real estate in Rialto. This has been going on for 2 years and it is getting old, but this isn’t the reason we penned this post. This isn’t a political attack on Eloise to unseat her because she is running unopposed. This post exists to call attention to Public Officials being held accountable for acting like children and feeding an angry mob. Daniel is a twin (Darrell Peeden); his twin was seeking an open seat on the Moreno Valley Unified School Board. 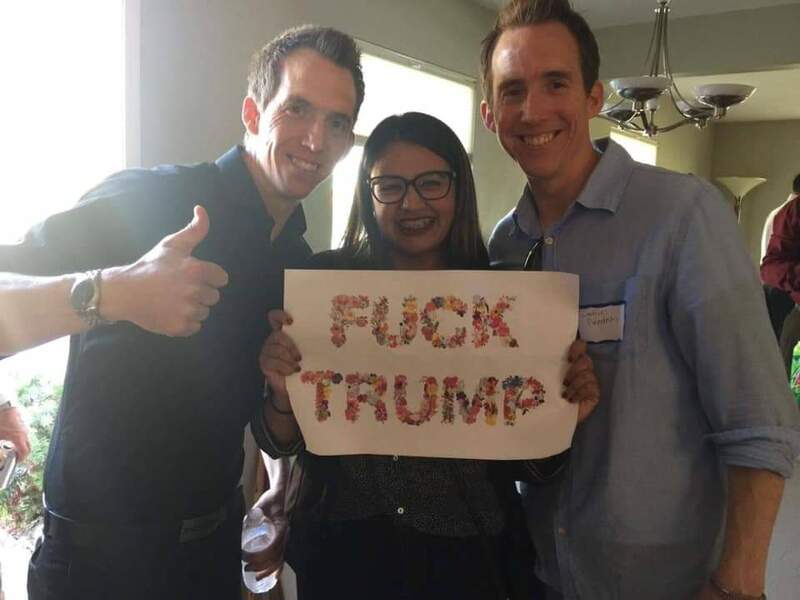 Darrell and Daniel Peeden posed with another person with an F Trump sign! Now we can love or hate the president if we want, but if you A) represent a community on behalf of an Assembly Member maybe you should have a little more tact on how you publicly share your disdain, and B) if you’re running for school board maybe you shouldn’t be using profanity publicly because you’re representing Students, Parents and Staff. You are supposed to be an example to them. Why is Eloise Reyes getting attached to this post? She condones this behavior and celebrates it. As you see in the photo below her staff are given kudos for working hard on ignoring constituents that don’t align with her politically and shoving through a very progressive plan of action. Remember that this seat has been Democrat forever but never with a person or staff so dedicated to whipping the assembly district into a frenzy. 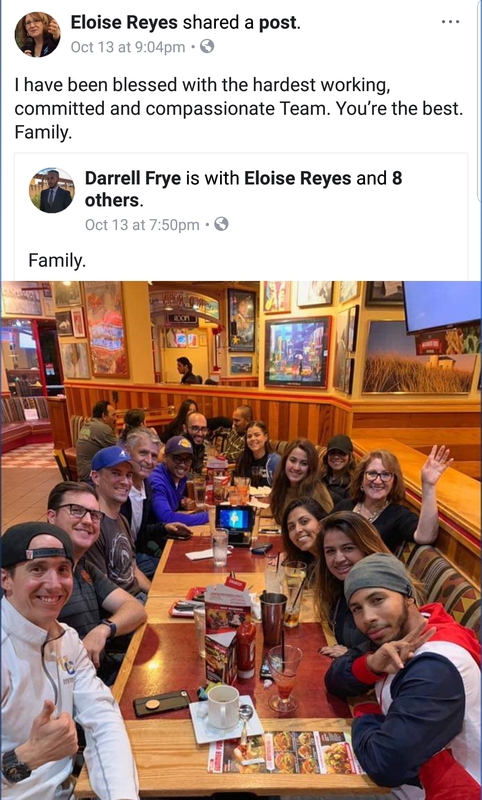 Reports are that no call from the assembly member has gone out to remove this photo from social media and Darrell Peeden was appointed to fill a vacant seat on the Moreno Valley Unified School District without an election of THE PEOPLE! Normal everyday people are already so full of hate, shouldn’t our elected officials and their staff be required to use just a little bit of thought when creating social content? We had a chance meet with Sean Flynn a candidate for the 31st Congressional District which stretches from Pomona all the way to Mentone! This district covers a large portion of Rialto and most of San Bernardino. The city of San Bernardino has been in trouble ever since the city went through bankruptcy and things have been pretty bleak. Many former San Bernardino residents that have returned for business or visits have described what they see when returning as a gut punch. Public Safety services and General Public services took a hit and still struggle to come back to life as San Bernardino rises from Bankruptcy. The recent shooting that put 8 people in the hospital including one minor has once again surfaced the talk of what can be done in San Bernardino to deal with crime? The answer currently is to place private security officers at the location of this most recent shooting and argue over how to police a city that seems to be still dealing with the massive collapse of their economy. The ideas being put forth now are the same old answers that sadly haven’t worked and even though the current congressman feels bad for those effected by this horrible incident he has nothing worthwhile to offer as a solution. Sean Flynn sat down with us to talk about a lot of what he wants to bring to the District if he is elected to Congress in November. His take on San Bernardino even before this horrible situation is so vital we thought it would be a good idea to put this part out before we release the entire interview. We thought this idea of taking federal resources and applying them to struggling communities was very innovative and hasn’t been brought forward yet, what do you think? Wednesday August 8th at 6 pm Council members Scott and Trujillo held a non public meeting to address the recommendations sent to city council from the Budget Advisory Committee. Councilman Scott spoke about not being prepared to address an already overdo 2018-2019 budget that began July 1st of this year. Over and over Ed Scott proved who he was aligned with the Police and to a lesser extent the Fire Department. Over and over Mr Scott made city staff out to be people who lied on a regular basis and kept information from him and the Budget Advisory Committee. It became clear in the meeting that a 8% 2 year retro pay raise PLUS an 8% raise for Police was appropriate in Mr Scotts eyes. Even though the city was starring down the barrel of massive debt to bloated employee pensions plus continued poor judgement in picking people to contract with in the city Mr Scott said the Police deserve a very high raise. Budget Advisory Committee member Joe Rayden tried to show Mr Scott the error of this massive raise looking back to staff report that said at 3% the city would find itself deeper in debt so 8% would speed up the cities ultimate failure to meet financial obligations it did no good. Mr Scott barked at anyone that would even hint at the Police raise being a bad idea. Many wonder where Councilman Scott and Trujillo were planning to get the money a little over 2 million in total to cover just this one raise? Looks like the two councilmen are looking at cutting Capital Improvement projects in the north end of the city. One project Ed Scott has on the chopping block is the $1.05 Million set aside since 2015 for additional community gardens in the north end of town. Those who don’t know it there are ZERO fresh food options available north of baseline also with home lots becoming more and more dense home gardens are becoming less available. When Mr Scott was asked why not fire the employees that lie and fail to move projects along he failed to respond. Other projects that Councilman Scott is looking at adding to the trash bin is a planned park in the new north end development, one that the city told builder Lewis that we would build. We have already spent some of the money that Lewis gave to construct the new park in the Renaissance Marketplace Area and the city has some sort of agreed obligation to begin building the park once Lewis begins building the homes. Also the Budget Advisory Committee wanted more accountability in regards to travel. The recommendation was that anyone wishing to travel on the cities dime out of the $100 thousand a year that the city council spends on travel the person would pay for the travel, give a brief written report about what taxpayers got out of this trip then they would be reimbursed. This would save money because less people would travel just to get a free trip on the taxpayers dime. Ed Scott said it wouldn’t save money because you would have to hire a special person to write his report because he is a legislative person and doesn’t write his own reports!!!!!! Councilman Trujillo sat there never really said much and I was unsure if he even knew why he was there. The final kicker was when I asked Pam Kennedy the council administrative assistant if this meeting was going to be open to the public. David – Is this meeting going to be a public meeting? Pam – No, not public. So I was surprised to see a member of the public come in and join the entire meeting. I loved having anyone from the public there because that means more people want information. What annoys me is that nobody seems to know what is going on down at City Hall. Will the City Council Choose to Overtax Residents This Week? On Tuesday July 24th at 6pm the City Council has the task of looking at the next years budget and the impacts of $120 to $150 Million in debt over the next ten years. There are a lot of tax ideas on the table and for the most part the city staff and the budget advisory committee have not advised any additional tax increases. The scary thing is that even looking down the barrel of hundreds of millions of dollars in debt the current council seems to be spending money like drunken sailors. 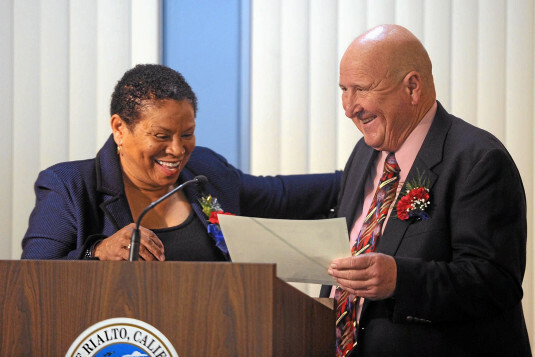 Most recently the massive 8% raise that Rialto Police Department got with a 2 year retro pay back wasn’t cheap. Early calculations put this raise at almost an additional Million Dollars a year (money we don’t have). There is no fund plan to replace equipment for these cops or to add additional officers to the streets as Rialto prepares to open a 2nd major retail development, we simply paid off the cops for some reason. What is sad is the Fire Department and other city departments all are still waiting for their turn to get a hand out and sadly we’re not sure there is anything left. Proposition 13 requires a 2/3 super majority vote. This creates a high hurdle for passage,due to the absence of overwhelming popular support. To avoid the 2/3 vote requirement, some cities establish the tax measure as a general tax (so they can abuse and steal this money as they see fit) and commit to use the funds to maintain or enhance public safety (often with advisory votes). Sales taxes are the City’s largest revenue source for the first time in years, due to the completion of several retail projects (Rialto Marketplace) and the capture of sales taxes from the Medline Industries facility. The City forecasts that it will receive $16,231,000 in FY 18, a growth of $9,053,377 since FY 12. Medline Industries reported quarterly sales taxes to the City for the first time in June 2017 and the City projects full year returns of $4,400,000. The City agreed to rebate 50% of this amount to Medline as an incentive to relocate its point of sale to Rialto, so the net benefit to the General Fund will be $2,200,000. As the Renaissance Marketplace completes toward the end of FY 18, sales taxes should receive another boost of approximately $750,000 per year in FY 19. Utility Users Tax – The City adopted the Utility User Tax in 2003 as an 8% levy upon all utility consumption. This revenue projects for FY 18 at $13,890,500. On June 5, 2018, the City’s voters approved a permanent extension of this revenue source. This revenue has grown reliably by approximately $500,000 each year because of economic expansion, and may receive continuing boosts in the years ahead from new development (Niagara and Building 5/6). The principal risk (other than repeal) is the trend toward co-generation and legislative exemption of certain utilities from the payment of local taxes. Households are also “cutting the cord” and eliminating cable TV service and landline phone service, depressing those sources of utility tax income. This is now a permanent tax at 8% and is supposed to be reduced to 6% as promised after the passage of the tank farm tax. PERS Tax – In 1958, the City adopted Ordinance No. 414 creating a property tax surcharge to fund employee retirement. The City Council annually established the tax rate and collected the property tax. The rate ranged from a low of 0.1000 to a high of 0.1506, with a historical average of 0.1316. When voters approved the Utility Tax in 2003, the City Council did not abolish the tax, but simply set the rate to 0.0% each year thereafter. The City retains the authority to levy the tax. The current City Attorney opines that the City may use the revenues from the PERS Tax only to pay for benefits. Residential Community Facilities District – A Residential Community Facilities District imposes a special tax upon the owners of new residential units offsetting the cost of public services, ideally producing a neutral fiscal impact to the City. Generally, residential development costs the City more in services than it provides in revenue, thus the special tax. The Developer of a new residential project approves the special tax and then passes it along to the homebuyer. The homebuyer considers this tax in the purchase decision. Transient Occupancy Tax – Most cities in California levy a transient occupancy tax on short-term stays in local lodging facilities. Rates range from 4% to 15% statewide. Rialto’s rate is currently 9% of gross room revenues. Rialto does not have a significant lodging sector; however, developers propose two new hotels in the Renaissance Specific Plan and the City Council set high priorities for such development. Increasing the TOT rate may discourage these uses, and the City Council has reduced other development impact fees to incentivize the new hotels. An increase in the TOT requires a majority vote of the electorate at a general election. The current rate is 9% in Rialto. Measure U – Adopted by voters in 2014, Measure U established a business license tax on fuel storage capacity. On November 4, 2014, Rialto voters approved a tax of up to $1.00 per cubic foot of liquid storage capacity for any wholesale liquid fuel storage business. The primary targets for the new tax were the businesses that operate the “tank farm” on Riverside Avenue, south of the I-10 Freeway. The businesses scheduled to pay the tax included, among others, Kinder Morgan, Tesoro, and Shell Oil. The tax did not apply to retail service stations. The City Council pledged to reduce the utility tax from 8% to 6% upon implementation of Measure U. On February 22, 2017, the Superior Court for the County of San Bernardino ruled in favor of the City of Rialto and determined that the tax was valid and enforceable. The plaintiff businesses then filed an appeal with the Appellate Court of the State of California. The parties expect to present the case to the Appellate Court in May 2018, with oral briefings approximately 6-9 months thereafter (late 2018 or early 2019). The City expects a decision before June 2019. 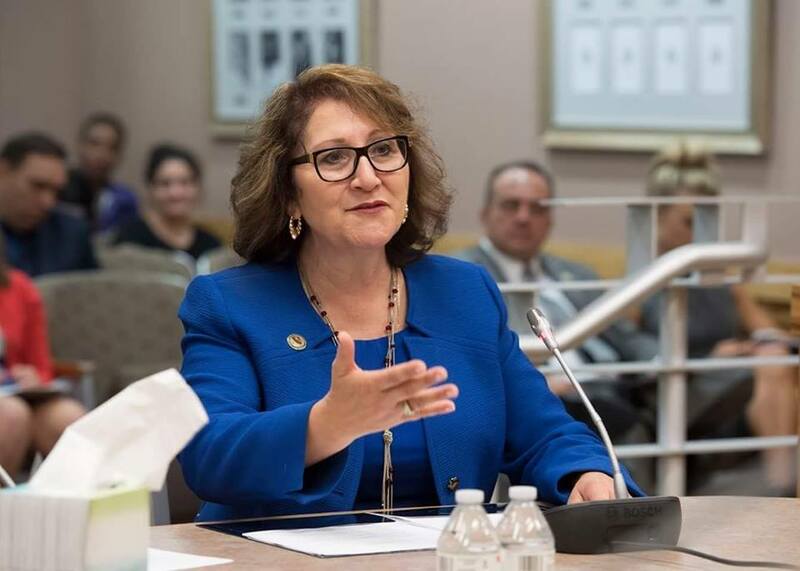 Depending upon the outcome, either party could appeal to the California Supreme Court, lengthening the time before a final determination. The City holds approximately $22 million in escrow pending the court determinations. The annual revenue averages approximately $8 million. The pledge to reduce the Utility Tax by 2% reduces the annual revenue yield by approximately $3.6 million. (this tax was sold as the savior to our financial woes and now there are talks of settling with the tank farm operators making this entire effort a wash if the council were to keep their promise on reducing the Utility Users Tax). CA opinion, it does not appear to provide a significant revenue source except as a cost recovery mechanism for the regulatory costs. Keep in mind the Trash Fee (TAX) is completely legal. The city charges you a fee every month because trash trucks cause to much damage to the road. So the city can tax you but not the people responsible for the damage!!!! Also remember Burrtec has a 10 year contract with the city and single handedly funds the Mayors campaign efforts. does collect out of pocket abatement costs. In 2015, staff proposed to levy additional costs for re-inspection costs but the City Council tabled the proposal for further clarification, again repeating the primary purpose of Code Enforcement. The City currently does not collect significant sums from code enforcement violations, primarily cost recovery for third party abatement costs. The Staff Recommendation is that City Council revisit added costs for extraordinary Code Enforcement compliance issues, notably repeat offenders. BAC Recommends that the City Council add stronger provisions to the Rialto Municipal Code authorizing administrative citations to encourage compliance, seeking restitution from repeat offenders, and instituting procedures to resolve code violations expeditiously. Get ready for the hammer to drop!!!! Street Sweeping Program – Most cities cite vehicles parked in areas scheduled for street sweeping. Throughout California, Regional Water Quality agencies are aggressively requiring cities to implement storm water remediation programs, and street sweeping programs implement this mandate. The City is developing the mechanics of a program to improve the efficiency of street sweeping. The City currently contracts with Burrtec for street sweeping services. Burrtec simply avoids parked cars, resulting in inefficient sweeping. The City must incur capital costs for signage installation, and recover its costs from fees. The goal of this program is compliance and neutral costs, and not primarily as a revenue generator. The City estimates the potential 1st year net revenue at $700,000. So residents have to decide how much more taxes are you prepared to pay? How much more control are you willing to give and why are you allowing the council to act so recklessly with your money? If you’re scared of talking to these people in public face to face then email them or call them. The only way they get the message is by knowing that there are others out there with questions!